From Our Factory to Your Kitchen. Then the Landfill. What are the odds of two Wrongest Product Award nominations dealing with bananas? It’s not like bananas are iconic fruit as, say, apples are. Apples have played a part in the Bible, in William Tell, in American patriotism, in New York City branding and in computers and cellphones worldwide. Bananas? Aside from slapstick comedies and the occasional bad R-rated joke, their lore is lean. But I guess bananas are, um, compensating with their prolific progeny. The second Wrongest Product Award nomination (following the inaugural nominee, plug-in air fresheners) went to a grocery chain that pre-peeled and then plastic-wrapped bananas. Presumably, it’s too much trouble to peel your own banana, and then you have to protect it because it no longer has a peel. This nomination addresses the next step: the burdensome ritual of cutting the banana into slices for your morning cereal or for your Elvis peanut butter and banana sandwich. For my own part, I’ve perfected the method of partially peeling the banana, leaving one side unpeeled so I can hold it in one hand while safely slicing through the peeled part with the other. But I guess others are not so adept and hence the Hutzler banana slicer had to be invented. Lloyd Alter of Treehugger.com first brought this emblem of modern convenience to our attention over a year ago when he reviewed it as another one of the “marginally useless things that fill our drawers and bloat our kitchens.” But then he was forced to withdraw the criticism (at least he says he’s withdrawing it; his mea culpa, I suspect, is more than a little tongue in cheek) when the many pages of Amazon reviews were drawn to his attention. The ingenious comments must there comprise some sort of gauge of both the human intellect and our capacity to waste time (while writing reviews of time-saving items). Kitchen accessories seem especially ripe for both unnecessary and humorous (intentionally or otherwise) designs. You know, the stuff of late-night infommercials. Or Saturday Night Live spoofs. 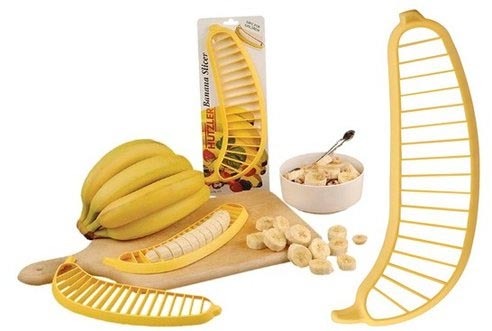 From Gizmodo, we recently received a digital gift basket of Wrongest Product Award nominees in a post titled “15 More Insanely Specific Kitchen Gadgets.” Among them, the hot dog gets its version of the banana slicer in the “dog dicer” – provided, I assume, so that, in case you don’t have a can of SpaghettiOs handy but you do have spaghetti and a hot dog, you can make your own. Calamity averted. Eggs must be a very inconvenient form of food. How else to explain the numerous egg devices in the Gizmodo post: hard-boiled egg molds, egg boilers and egg crackers? (Store them with your Egg Topper Cutter, also available in a more phallic and less threatening version, and your egg slicer.) Then there are several items to ease our constant battles with produce: cucumber and apple slicers to add alongside the banana guy — all stored, of course, in your drawer devoted to specialty slicers — an orange peeler thingie, a mushroom cleaner and, yes, a pomegranate “deseeder.” My favorite, though, has to be their headliner, the s’more maker, bringing you the rewards of camping (or at least of getting the fire in the fireplace started) without the hassle, via your microwave. We have a rule in our house that anything we want to own has to have been needed at least three times and anything we keep has to have been used at least once in the previous three years. (Don’t hold me to it, though; we do break the house rules sometimes, as some of my wife’s many collections will attest.) 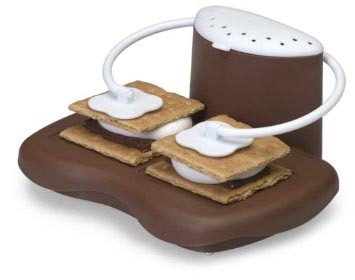 Yes, we actually have used our fondue maker (itself purchased used) more than three times, and perhaps we’ll make s’mores at home more times than our self-imposed pre-purchase minimum. But I prefer my s’mores made with both less convenience and less plastic. The Wrongest Product Awards will go to those products (and their designers) that embody the least amount of redeeming value while incurring the use of unnecessary, often gratuitous, materials or energy. How is this relevant to EcoOptimism, you might ask? Easy – it shows how extraneous so many products are, often in a “what-were-they-thinking” sense. Nominations are open. Send yours to ImNotBuyinIt (at) EcoOptimism.com. This entry was posted in Wrongest Product Awards and tagged consumption, Lloyd Alter on April 16, 2013 by David Bergman.